Giorgio Sadotti approaches the making of work in as simple or straightforward a manner as possible. Whether it is going to New York and not saying a word for 24 hours, arranging for violinists to play the noise of sirens whilst walking as quickly as possible through the corridors of a busy building, organising a collection of magazine pages with images of balls on them, or overlapping the pages of books, his simple arrangements can conjure complex relationships. Overlapping or collision seems to be a key to many of his works; causing two things to meet can result in surprising outcomes. Arranging the found images of balls in size order and using their centre as the indicator of height defines their layout and results in a disordered pattern. Placing the standard instruments and equipment a rock band would need to perform (drum-kit, guitars and microphone) in a gallery space allows the audience to contribute to the creation of a work through its use. Overlying pages of the same book according to rules defined by the gallery space and the natural mirroring of the order of the book results in new images and structure that engage through a will to decode and decipher. ‘IF SO’ is a large digital print of a younger Giorgio taken while he was living in Manchester. The image has a nostalgic and romantic feel – marks of decay point us towards the passing of time that the original photograph has been through (along with the suggestion of the parallel decay endured by the artist), an orb of light plays at the corner of the artist’s mouth and moisture glistens on the artist’s brow as if he has stepped from the sea onto a sun-kissed beach or been for a long run. The image has captured the artist at a moment in time, and although it has degenerated slightly, it is now frozen through digital capturing while the artist moves onwards and downwards. The image is overlaid with a screen print in silver of the words ‘IS BEFORE’ written in HI DE, a font designed to Giorgio’s specification that incorporates elements of corrosion and decline, reinforcing the aging of the artist and the image. The layout of the word ‘IS’ above the word ‘BEFORE’ results in the appearance vertically of the words ‘IF SO’, creating the title of the work. 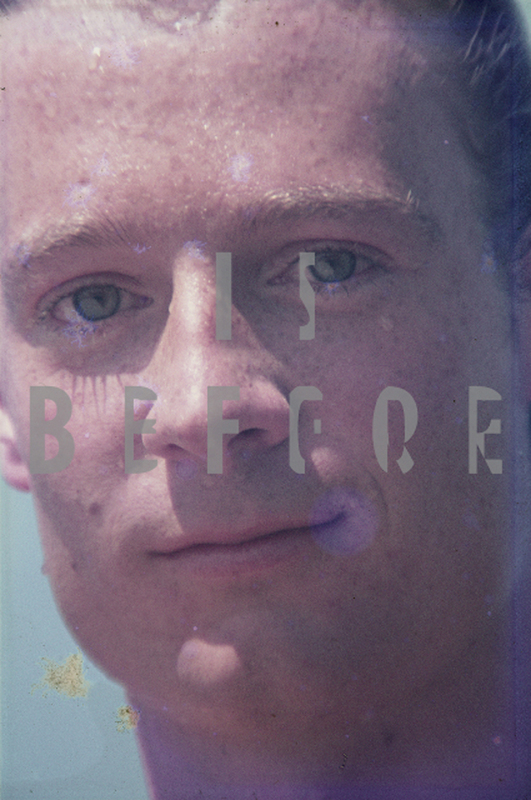 ‘IS BEFORE’ could refer to the fact that the image was taken before now and ‘IF SO’ is an open-ended statement leaving us to fill in the blank. Giorgio Sadotti has had solo exhibitions at the Milton Keynes Gallery (2010), Limoncello (2008) and the Henry Moore Institute (2006). He has exhibited in many group shows including Space and PS1 in New York. Giorgio exhibited at City Racing in 1993, and in 1996 participated in a group show in Vienna curated by Muntean and Rosenblum on behalf of City Racing. He received the Paul Hamlyn award for artists in 2003 and his work is in public collections including the Tate and British Council.